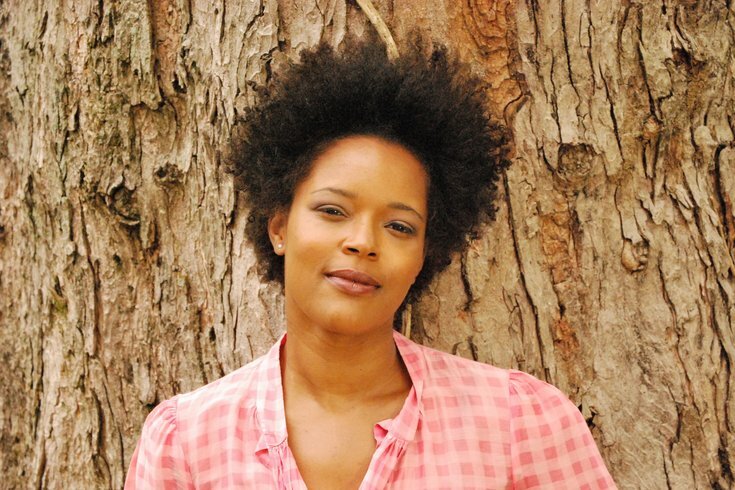 Newly appointed Philadelphia Poet Laureate Yolanda Wisher was previously selected as a Pew Center for Arts & Heritage fellow in June. During a press conference held Friday at City Hall, Mayor Jim Kenney and Chief Cultural Officer Kelly Lee announced Yolanda Wisher as Philadelphia's third poet laureate. Wisher, a 39-year-old North Wales, Montgomery County native, succeeds Frank Sherlock, who made his mark by appearing for more than 100 local lectures, workshops and performances during his two-year term, as well as establishing the Write Your Own Block project. Activist and scholar Sonia Sanchez preceded Sherlock as the city's first poet laureate in January 2012. Wisher is best known as Montgomery County's first (and until recently, youngest) poet laureate, appointed in 1999 at the age of 23, and as the author of "Monk Eats an Afro." At the press conference, Beth Feldman Brandt, part of the committee that selected Wisher, said Wisher "rose to the top" early in the selection process. “It’s a huge honor; it’s always surprising, and it’s not something you expect," Wisher told PhillyVoice of the appointment. "It’s definitely a vote of confidence after many years of doing the work. And also, it feels good that the work, aside from just writing the poems, gets acknowledged. I feel like in the poetry world, community arts and activism are side things you do, or supplemental, and not necessarily celebrated as a way of working as a poet." To be sure, Philadelphia's poet laureate position is very much a civic role, rather than a "lifetime achievement award," as Brandt put it during her speech. In Philadelphia, past poet laureates have set the precedent of using the role to activate nooks and crannies of the city that sometimes get overlooked and have found new ways to engage youth, whether through poetry slams or mentorship of Philadelphia's youth poet laureate, a position currently filled by West Philadelphia High School student David Jones. 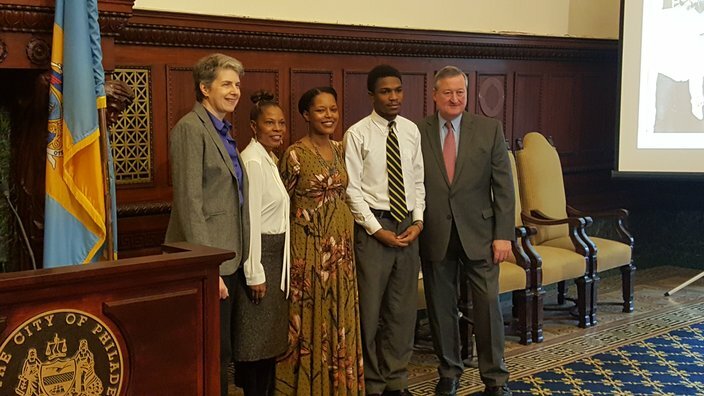 From left to right: Beth Feldman Brandt, chair of the Poet Laureate Governing Committee; Kelly Lee, chief cultural officer; Yolanda Wisher, Philadelphia poet laureate; David Jones, Philadelphia youth poet laureate; Mayor Jim Kenney. Wisher explained that, as poet laureate, she hopes to break through comfort zones that sometimes make the city's poetry community clique-ish, and hopes to also spotlight the political empowerment that comes with poetry. “It’s all about the voice; everybody needs a voice," Wisher said. "And I feel if [poetry is] taught in the spirit of democracy and everybody has a part to play in poetry, then it’s not this elitist art form. It gives people a voice, a real say in their own history." Wisher, who closed this morning's conference with a reading of "A Love Letter to Philadelphia," isn't wasting any time: Alongside USDAC, she'll host her first event on Feb. 20 at the Painted Bride, a "civic ritual" that has poets local and from around the country delivering State of the Union-like addresses through poems. Los Angeles Poet Laureate Luis Rodriguez will be in attendance.